Udaipur: The Federation of Rajasthan Trade and Industry (aka FORTI) is an apex chamber of Trade & Industry of the state of RAJASTHAN. FORTI acts as a bridge between the government of India and the government of Rajasthan and its members.Headquartered in Jaipur since 1953, FORTI has its independent chapters in six divisions in Rajasthan and branches covering almost the entire state. The extension of the branches is in the process thus making a presence across the state emphatically.FORTI further has an International presence with branches in countries like Germany, Italy, Bangkok, and Kenya. 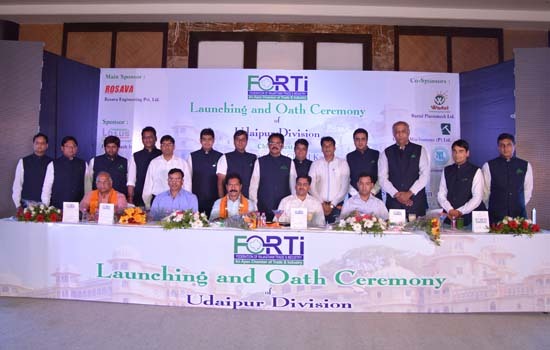 The Udaipur chapter of FORTI started operating in June 2016 with the objective to provide a solution of various problems related to trade, industry and general society, clarification of multiple rules regulations and enacted laws. students of management/engineering institutes, representatives of trading/industrial organizations and dignitaries from the generalpublic are invited to participate in these events and take benefit out of the discussions. They explain and clarify the details of rules, regulations, and laws and also clear the related confusions of the delegates present. Few of the corporate programs organized by FORTI Udaipur are: Seminar on SME Listing in Stock Exchange. Seminars intend to educate about smart ways of operating. Instead of taking loans from banks for the expansion of their company to small turnover companies, suggestions are given to get listed on the SME stock exchange, to provide information about the funds collected from the investors for their company. Seminar on Solar Energy. Seminars are organized to talk about the solar energy under the auspices of Rajasthan Solar Energy Association and Udaipur Smart City Limited on behalf of Federation of Rajasthan Trade and Industry on the demand of information related to Solar Energy of Udaipur entrepreneurs. Workshop on Women Entrepreneurship Empowerment. Workshops are organized for teaching and promoting women entrepreneurship and marketing trades. The woman empowerment needs knowledgeable and informed decision making power andthese workshops aim at instilling confidence in women through powerful teaching techniques thus making them confident to take decisions.Seminar on Goods & Service Tax (GST). Ever since the GST came into force, there have been more misconceptions than facts. Seminarsare organized to provide detailed information about SGST, CGST, and IGST to address the curiosity of professionals. Seminar on “Real Estate Regulation Act (RERA)”. It helps in clearing doubts and spreading the trust among the people. Under RERA, information on penalties, subsidies, and completion certificates, project registrations, RERA website, etc is shared. Seminar on “Business Opportunities in Abroad: Focus Africa”. Detailed information about the African market, various business opportunities in Africa, different sectors and prevailing trends etc. is shared through these presentations. The idea remains to remove the illusions against Africa and spreading awareness about the available resources and opportunities.Seminar on “Filing returns under GST”. Seminars for solving the problems of different types of GST and the last days of the formation and participants are organized. Seminar on “Industrial Finance & Wealth Creation”. To further increase the industry, the government has made aware consumers about the availability of subsidy rates and easy availability on easy terms. Seminars are organized to explain the difference between savings and investment and give comparative information about different options of investment.